Nonlinear editing seems to have become a must have feature in film these days. And when done well it can elevate an average story into something unique. However "American Ultra" never aspires to do such a thing. Rather its only bit of nonlinear editing feels tacked on in an attempt to add that "something" it was missing. It amounts to a needless editing technique that places the end at the beginning thus eliminating any tension going forward because we know good and well where this story is headed. The story involves a pot smoking convenience store worker who is actually a well trained experimental agent, except he doesn't realize it. It is, of course, based on the CIA's illegal mind control program Project MKUltra, hence the name "American Ultra" (anyone remember "Conspiracy Theory?"). The trailer may have you convinced that this film would be some combination of "Pineapple Express" and the "Bourne" films, but that isn't really the case. There is some smoking of pot, but once he becomes "activated," the smoking goes away. Rather it's more like an indie romcom meets the "Bourne" series. Mike Howell (Jesse Eisenberg) is the aforementioned convenience store worker. He lives in a small remote town in West Virginia with his girlfriend Phoebe Larson (Kristen Stewart). They clearly love each other, and she's something of a saint for putting up with him. He has frequent panic attacks, usually tied to the idea of leaving the small town (we learn why he suffers from this condition later on in the film). While at the airport waiting for a flight to Hawaii for vacation, he suffers one of his panic attacks and they miss their flight. She's upset, but quite forgiving. Not much longer after that a mysterious woman shows up at the store repeating a bizarre phrase neither we nor Mike can make any sense of. Nevertheless, this is where things change. The mysterious woman, Victoria Lasseter (Connie Britton), is a CIA agent who goes out of her way to "activate" and help Mike survive when new head of the department Adrian Yates (Topher Grace) decides to remove the potential threat of this sleeper agent leaving the remote area they left him. Shortly after his "activation" he finds himself in need of his buried skills as two armed men approach him. One of the running gags throughout the film involves these skills taking over in the nick of time allowing him to kill his attackers in increasingly violent ways with normal everyday objects found around convenience stores. It's mostly so that everyone else can say, "he killed someone with what?" He defeats these first attackers with a spoon and a cup of hot soup. Better yet is his reaction after the fight when the training has receded and his usual personality takes over. He calls Phoebe and the two are forced to go on the lam as more and more agents show up. The film is generally at its best when in indie romcom mode allowing Mike and Phoebe to build their relationship. Eisenberg and Stewart do well in their respective parts, even if I had a slightly hard time accepting Eisenberg and his wiry frame out muscling bigger stronger agents. 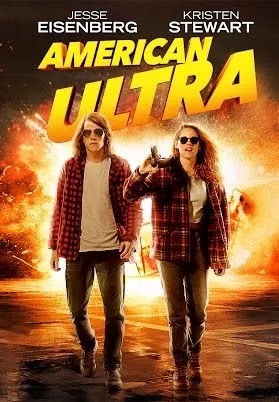 Yet at the same time "American Ultra" wastes a handful of talented supporting players. John Leguizamo has a small, one note role as Mike's foul mouthed drug dealer. Bill Pullman has an even smaller role as the man in charge of all this nonsense, despite not showing up till after things have pretty much run their course. Topher Grace's character is a slightly over the top, sniveling jerk whose motivations don't particularly make sense. He's certainly hellbent on killing Mike in an attempt to prove the effectiveness of his own set of experimental agents. But mostly he just revels in every opportunity to be a jerk to all other agents, particularly Britton's Victoria Lasseter. His top experimental agent is also the craziest. He's known only as Laugher. It's a fitting name considering his tendency for crazed, maniacal laughter. He's played effectively by Walton Goggins (known mostly for his role in "Justified"), and while Laugher is mostly a crazed killer he is allowed a moment of connection with Mike late in the film that does add a layer of depth to the character. Tony Hale (known for his hilarious character in "Arrested Development") is given such a small part I very nearly forgot to mention that he was even in this film. However, likely the most wasted here is Connie Britton. Her character has potential, but she's given very little to do, and isn't allowed much depth or backstory. Nevertheless, we do come to feel for her as she's continually run down by her much younger superior Adrian Yates. There's so much backstory for them to tell us over the course of the film, but as we know, film is a medium of "show don't tell." This film tells quite a bit. It seems they missed their opportunity for nonlinear editing, wasting it instead on a scene that gives away the final moments of the film. The question as to why and how Mike received his training and what it was meant for never really becomes what the film is about. While, again, it is explained in a short talky scene, it never becomes a thing of interest. 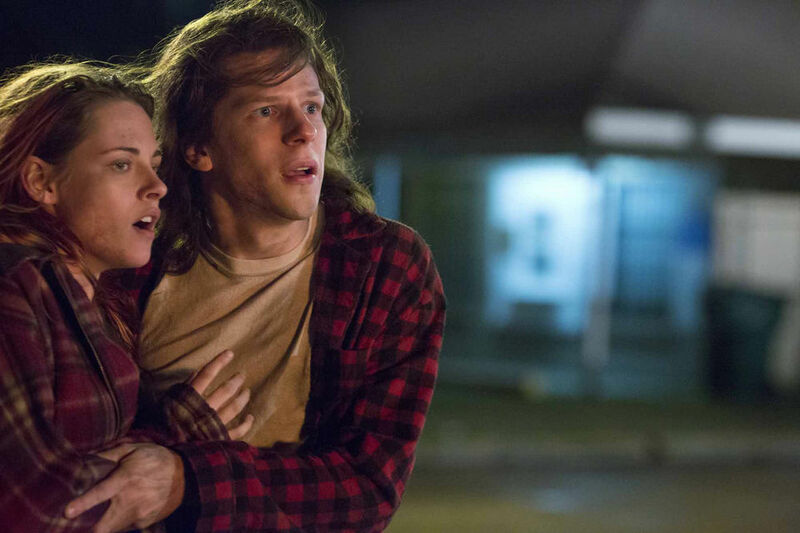 The thing that does string us along is the indie romance hiding within "American Ultra." Once you get past all the bright flashes, the loud music and bloody action sequences, it is at its heart an indie romcom disguised as a spy/action thriller. It's easily the most satisfying element the film has to offer. Unfortunately the spy elements don't quite match in quality. While it does occasionally offer some well done bits of action, those sequences never really elevate the film. 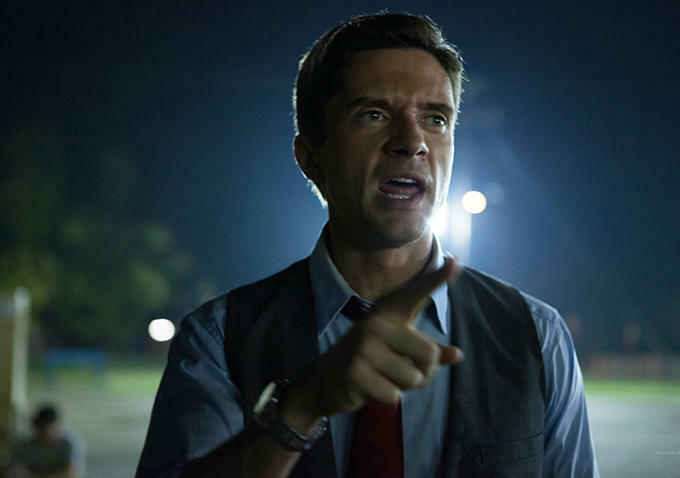 Much of the scenes involving Topher Grace left me questioning the absurdity of his actions. Surely this isn't remotely how any government agency works. In fact, despite Mike and Phoebe being the pot smokers, they're far less absurd than Adrian Yates. Yet he and his actions don't play for comedy, or at least they don't work, if that were their intended purpose. Typically a film trying to be too many different things at once don't work. "American Ultra" comes close to going overboard. It fares better than most, yet as a whole it doesn't become a satisfying thing either.